Tinkler, largest shareholder of Whitehaven with over 20% of shares, is trying to arrange financing to buy the full group. An initial approach was rejected by Whitehaven as financing of the bid was not deemed solid. Consultancy PWC recently published its annual study on the key industry trends in the mining industry, focusing on the 40 largest mining companies. This year’s report is titled ‘the growing disconnect’, zooming in on the paradox between the need to build new projects to increase supply and the reluctance by shareholders to have their companies commit funds to investment. Record historical results, high commodity prices, and a bullish outlook shared by many miners continues to underline the industry’s strong fundamentals. But investors’ reluctance to emerge and support growth plans points to a growing disconnect between the market and the mining industry. The report presents the numbers around investment and use of cash for the Top 40 mining companies: $98 billion was invested in capital projects in 2011 and plan for a further $140 billion for 2012. At the same time share prices have decreased across the line. PWC argues 2011 marks the start of the growing disconnect. For thousands of years the mining industry has supplied the world with the raw materials the growing population needed for ever increasing consumption. However, mining is not the only supplier of these raw materials. Next to the primary mining industry a secondary mining industry is growing: ‘urban mining’. The existing stock of materials in the urban environment is recycled more and more. 38% of iron input in the steel making process comes from scrap. The average ‘new’ copper cable contains some 30% recycled material. The more we recycle, the less we need to mine. As mining costs increase because ‘easy’ mineral deposits are becoming scarcer and as technological improvements make recycling more competitive, the impact of urban mining on the traditional mining sector grows. How does this change the perspectives of the mining industry in the long term? And which factors will play an important role in shaping this future? ENRC agreed to pay $1.25bln to First Quantum to settle the dispute over the Kolwezi Tailings project, the Frontier and Lonshi mines and related exploration interests in DRC. First Quantum was stripped of the rights to these projects by the government, after which ENRC came in and agreed to buy the rights from the government in a move widely criticized in the industry. Coal India, by far the largest miner of energy coal in the country, has agree to a 25% permanent increase of wages. In august of last year the unions demanded a 100% increase to offset increased cost of living and reduce the increasing income gap between management and workers. Investment bankers at the time expected the company to agree to a 15-20% increase. The salary hike results in an increase of operating cost for the company by approx. 10%. The closure of the export facilities in Port Hedland because of cyclone Heidi and the cancellation of shipments from Brazil because of heavy rains results in supply pressure in the iron ore market. Heavy rains are expected to continue in the Pilbara region, which supplies close to 40% of seaborne iron ore in the world, in the short term. Extreme weather conditions have a big influence on bulk material supply chains in the short term, because stockpiling these materials in amounts large enough to last for several weeks is very costly and thus not a normal practice. Especially the steel industry is hit hard with both iron ore and metallurgical coal having to be shipped in from locations that are often hit by storms. Although the impact on spot prices in the short term can be large, the longer term impact on the miners is quite small. Most contracts allow for some flexibility in when exactly the ore is delivered. As long as the mining operations don’t have to stop, the ore will get to the steel manufacturers as some point. The wage increase expected for Coal India is a good example of the very high cost inflation of mining in developing countries. Whereas the cost increase of contracted services and equipment leasing can be seen as (at least partly) a temporary phenomenon caused by high commodity prices, the cost increase because of increased labor and consumable costs in developing countries causes a more permanent shift of the global cost curves. 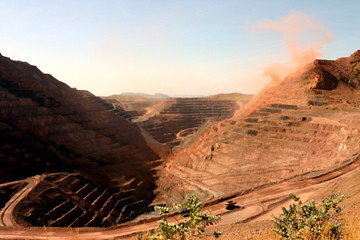 “Freeport-McMoRan Copper & Gold Inc.’s Indonesia unit suspended mining operations at its Grasberg mine in West Papua on Thursday, as workers started a strike that could last a month, a labor union spokesman said. ‘All of the mining operations, except for the public facilities, are shut down,’ Juli Parrorongan told Dow Jones Newswires in a text message. All workers at the mine are participating in the strike, which will last until Oct. 15 if the company refuses their demand for higher pay, Mr. Parrorongan said. Grasberg forecasted 2011 total mine sales of 1 billion pounds of copper and 1.3 million troy ounces of gold, representing approximately 3.1% of global copper production and 1.5% of global gold production. Current negotiations started after an 8-day strike in July. Freeport offers a 22% wage increase over 2 years, but unions demand an increase of salaries by more than 100%. Copper price has been relatively stable for the year to date, but the news of the strike at Grasberg coincides with reports of falling production in Chile and increased buying by Chinese traders, potentially leading to a new price rally. Several analysts still expect a modest global copper supply increase for the year. However, if strikes spread to other mines supply for the year might actually decrease for the first time in about a decade. Global production has almost doubled in the past 20 years, only experiencing a short stabilization in 2002-2003. “Building new mines is getting costlier, thanks to higher energy and wage bills as well as equipment shortages. Investing in new copper mines is 50% more expensive in real terms than the average since 1985, HSBC estimates. This acts as a brake on new growth projects. Tighter regulation also slows development; Anglo American estimates getting the right permits to set up a new mine in Australia takes three years now, compared with one year back in 2006. Many analysts and investors, however, are well aware of the industry’s shortcomings already. Commodities consultant Brook Hunt says it discounts planned industry production growth by 25% for brownfield projects, and by 50% for totally new projects. For a key commodity like copper, it also discounts production forecasts by 5% per year to allow for strikes or poor weather. All large miners report increasing costs, but the high commodity prices still help them to retain profit margins. Large projects are typically phased so that development costs can be controlled per phase. In its latest annual results presentation BHP Billiton reported the increase of capital intensity of iron ore production (for BHP mainly in Western Australia). Costs per tonne of capacity currently are around $200, while pre-crisis costs were below $100 per annual tonne. The issue of cost pressures will partly solve itself when demand falls and prices decrease: demand for labor and equipment will fall too, enabling cost cutting. The difficulties of capacity increases is more fundamental: new projects have lower grades, are more remote and located in less stable areas politically, leading to both high costs and more effort required to set up a financially stable project. persistent supply side constraints continued to support the fundamentals for the majority of BHP Billiton’s core commodities. In that context, another strong year of growth in Chinese crude steel production ensured steelmaking material prices were the major contributing factor to the US$17.2 billion price related increase in Underlying EBIT. BHP Billiton, which uses a fiscal year ending June 31st, reported record full year EBIT of $32bln on revenues of $72bln. The 62% year on year increase in EBIT was mainly caused by ‘uncontrollable’ price increases. BHP managed to increase volumes slightly, but this gain was offset by higher costs of over $1.4bln. In a breakdown of the cost increase BHP estimates approx. half of the increase to be structural. Analysts point at the weakness of BHP’s buy-back program, in which the company runs the risk of overpaying for its own shares. In general the buyback and dividend program reveals the lack of investment options and the hesitance of management to embark on aggressive expansion in the light of global economic and financial uncertainty. Though industry leaders continue to mention supply shortage as key industry driver, they don’t want to end up at the top of the cost curve. Key developments to watch in the coming months are the continuation of China’s rapid growth; high iron ore, copper & coal prices; and survival of the international financial system. If any of these trends turn around, 2011 might well be the peak of the mining industry’s profits, after which the mantra of ‘cost control’ replaces the current theme of ‘capacity growth’. “The price of iron ore will remain above $150 a tonne for at least the next five years, according to Vale, the top miner of the ­commodity. The bullish prediction by Guilherme Cavalcanti, finance director of the mining group, is the latest contribution to a debate on the outlook for the iron ore market that has polarised analysts and investors. Used to make steel, iron ore is the largest contributor to the profitability for the three largest mining groups: BHP Billiton, Vale, and Rio Tinto. And if Vale’s forecast is correct, the three companies’ shares would be expected to rise sharply. Vale’s finance director explains he is not concerned about high inflation in China as mainly the consumer goods price inflation is high, while construction activity still ensures full offtake of Vale’s production. Commodity swaps indicate the market expects prices to decline steadily over the coming years. While Vale expects Asian demand for iron ore to stay strong, the companies mainly sees restrained production because of delayed development projects (often because of environmental permitting issues) and weather influences as the key driver for high prices. Together with the high inflation in equipment costs and the relatively weak dollar iron ore prices will for a prolonged time be very elastic to supply. Vale’s share price is lagging behind the price of its main competitors over the past years, resulting in higher cost of debt and reduced ability to perform share based M&A. With Vale’s large exposure to the iron ore price the company would benefit strongly from higher iron ore price expectations in the market.